With rhyming text, this soothing bedtime book is an ode to baby birds everywhere and sleepy children home safe in their own beds. As a mother describes to her child how many species of birds nest, from pigeons on concrete ledges to owls in oak tree boles to swallows above barn do... read full description below. With rhyming text, this soothing bedtime book is an ode to baby birds everywhere and sleepy children home safe in their own beds. As a mother describes to her child how many species of birds nest, from pigeons on concrete ledges to owls inoak tree boles to swallows above barn doors. 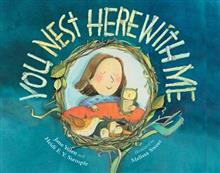 The soothing refrain of you nest here with me eases her little one and readers alike to slumber. Combining their poetic writing and their love of birding, mother and daughter Jane Yolen and Heidi Stemple have written what is sure to become a bedtime classic. Jane Yolen has received numerous awards for her writing, including the Golden Kite Award, two Christopher Medals, and both the Kerlan Award from the University of Minnesota and the Regina Medal for her body of work. She lives in Hatfield, Massachusetts, and St. Andrews, Scotland. janeyolen.com. Heidi Stemple has published almost 20 books and numerous short stories and poems, mostly for children. She lives on an old farm in western Massachusetts. Melissa Sweet has illustrated nearly 100 books for children. She wrote and illustrated Balloons Over Broadway which garnered many awards including the 2012 Sibert Medal. She also illustrated A River of Words: The Story of William Carlos Williams by Jen Bryant, a 2008 Caldecott Honor book. She lives in Rockport, ME.